Royal India Holidays Pvt Ltd provides Cheap Bhutan Tour Packages because Bhutan is often called extra ordinary tourist destination. This Himalayan mountain kingdom is replete with legends and myths and showcases an eclectic mix of ancient traditional cultures and the latest global developments -- with loads of enthusiastic flair. Officially referred to as the kingdom of Bhutan, this land locked nation in South Asia is located towards the Eastern fringes of Himalayas and embraced by surrounding states of China, India, Tibet, Nepal and Bangladesh . With amazing mountainous landscapes, snow capped peaks standing tall over lush primeval forests, incredible fortress like dzongs and stunning monasteries; Bhutan succeeds in attracting tourists from the remotest corners of the world. The country is also best known for its Buddhist architectural bounties, which appropriately embodies traditional Buddhist culture – and in more ways than one. 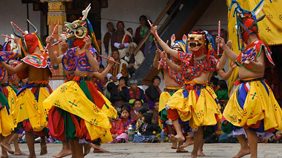 The spectacular religious dance performances and festivals of Bhutan are as attractive as its handicrafts and textiles, spectacular trekking trails, outrageous archery competitions and exotic collection of flora and fauna. All this and more sets Bhutan aside as the last great existing ‘Shangri La'. Bhutan stretches across 300 km in length and 150 km in width and is bounded by India in the south-west and Tibetan and China in the North West and west respectively. 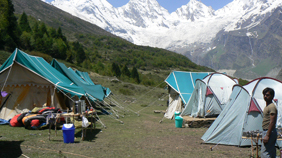 Its spectacular landscapes are marked by gorges, lush valleys, rivers, foothills and the Mighty Himalayas. Fast evolving as a premier destination for adventure seekers and sports aficionados alike, Bhutan boasts of the perfect location for hours of kayaking, mountain biking and fishing fun. Whether it is about speeding down crystal clear rivers fed by high glaciers or trekking along through the virgin forests fringing its lush valleys, this little kingdom provides one-of-a-kind experience for adventure lovers –in an unexplored and unspoiled environment. While in Bhutan, you can zip across rugged mountainous landscape on both off/on road mountain bikes or cut across valleys and plains to enjoy the waters of Brahmaputra River in India –in your own colourful kayak. Bhutan’s beautiful wilderness also attracts cyclists, anglers, rock climbers and trekkers looking for gruelling adventures in its imposing glacial valleys, pristine mountain lakes and the mighty Himalayas. Bhutan is also a paradise for ornithologists and bird lovers. With over 670 species of birds to its credit and many more waiting to be discovered, the country is indeed a haven for bird watchers. Over 50 species of its known birds are winter migrants and include waders, thrushes, finches,’ ducks, birds of prey, and buntings. Get ready to get surprised in Bhutan. Here it’s illegal to buy cigarettes, rice is red and chillies are the main ingredient in authentic cuisines. Travelling through the scenic terrains of Bhutan, you will find school kids donning the gho and kira and houses painted with traditional Buddhist art forms and other aesthetically appealing motifs. The population is fun loving, well educated and vibrant. Need you to ask for more? 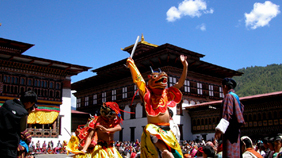 Apart from experiencing the magical charm of Bhutan’s enigmatic culture, festivals, cuisines, Buddhist influences, traditions, religion, royal political opulence and mesmerizing natural scenery; tourists in Bhutan also love to gape upon its majestic monuments, places of historical significance, wild life reserves and urban diversity. After experiencing picturesque Bhutanese villages you can savour the concrete utilitarian bounties of Thimphu, Samdrup Jongkhar, Phuentsholing, Paro, Mongar and other cities (Trashiyangtse and Trashgang being notable exceptions). Remember to visit OIakar—the birthplace of Buddhism in Bhutan, Punakha which hosts the monastic body in chilly winters and Trongsa - famous for its Tower of Trongsa and dzong. Wild life enthusiasts and animal lovers would like to visit Jigme Dorji National Park, Jigme Singye Wangchuck National Park, Royal Manas National Park, Phibsoo Wildlife Sanctuary, Bomdeling Wildlife Sanctuary and Thrumshingla National Park—along with many other locations flush with animal life and exotic species of birds and insects. The central, western and eastern parts of Bhutan (Thimphu, Wandue, Ha, Paro, Trongsa, Bumthang, Lhuntse and Trashi Yangtse) experience winters from November to March with the rest of the year being pleasant and tourist-worthy. Southern Bhutan boasts of a sub tropical climate with isolated showers during monsoons. The only airport is at Paro. Bhutan's national airline, Druk Air, is the only airline servicing Paro. The road from Bagdogra (the nearest Indian airport) enters Bhutan at Phuentsholing, the border town. NOTE: Entry / Exit - one way has to be by air. Valid passports and an entry visa are essential. NOTE: Visas cannot be obtained at Bhutanese embassies. You will have to apply for visa through your tour operator in Bhutan. Visa is issued a month prior to your arrival and the visa number is advised to you. Actual visa is stamped on arrival at the Paro Airport. Export of antiques, plants or animal products are strictly prohibited. Cameras, video cameras, computers and personal electronic equipment must be declared on arrival and will be checked upon departure. Southern Bhutan has a tropical climate with hot humid monsoons. Spring in the higher valleys (mid-March to May) has warm days (20 °C) and cool nights. June marks the beginning of summer when day temperatures warm up to 27 - 29 °C. By July, the rainy season starts and continue till mid-September. In December temperatures fall, but the days are warm and the clear, azure winter skies serve a striking background to the snow-capped peaks. On a sunny day, temperatures reach about 16-18 ° C. The nights, however, are cold with temperatures falling below freezing. Cottons and light woollens in Summer (June-Sep). Heavy woollens and jackets the rest of the year. Rain gear for the monsoons and comfortable shoes. 230 - 240 volts, 50 cycles A.C. The current is variable. The national currency is the Ngultrum (Nu). 100 Chetrum = 1 Nu. Exchange rate is approximately US$ 1 = Nu. 45. Indian Rupees circulate at par. American Express and VISA credit cards are accepted in a few shops. Travellers cheques are also accepted. Reliable telephone and fax services are available in all towns in Bhutan. International connections are excellent. Dzongkha, the language of the western region, is the national language. English is the medium of instruction and is spoken by all government officials and businessmen. Bhutan is the only country in the world to retain the Tantric form of Mahayana Buddhism (Drukpa Kagyu) as its official religion. Throughout Bhutan, stupas and chortens (temples) line the roadside commemorating places where Guru Rinpoché or another high Lama (priest) may have stopped to meditate. Prayer flags dot the hills, fluttering in the wind. The Bhutanese believe these help to maintain constant communication with the heavens. Before visiting Bhutan, you may need to get the following vaccinations and medications for vaccine-preventable diseases and other diseases you might be at risk for at your destination. For more information consult your doctor. To protect against unforeseen accidents and mishaps, we advise you to have Travel insurance policy from your country. It should adequately cover helicopter evacuation and medical assistance. No such policies available in Bhutan. 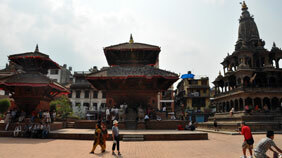 Traditional handicrafts, textiles, jewellery, baskets, masks. Paintings and woodcarving make good buys.